It’s a little chilly here tonight in the Valley of the Sun – a continuation of what has been a chilly (for around here) week. The pool had made it all the way up to a hopeful 61 last Sunday, but these last few days have knocked some sense back into it, and it has dropped ten degrees – so there won’t be swimming any time soon, I can tell you that! But my Goodboys mates and friends and family up in the Northeast don’t have to weep for me – I know what kind of a winter you’ve been having, and it looks as if there’s more on the way. Man, I’m jealous – I read about a “Groundhog Day Monster Storm”, and as a New Englander I long to be in the middle of it all! Get your milk, bread, and candles fast! Police say the man apparently thought he was at a probation office, not a police station. Well, THAT’S certainly splitting hairs, isn’t it? * “The View”‘s Joy Behar thinks the Obamas are “too perfect” to be mocked. Riiiiight…. Anything you can do to avoid The Man, I say. But didn’t anyone think to check the goat for identification? I would never go anywhere without my wallet! * When you consider the world we live in I have to think there are better ways to spend $155K than to clone your most beloved pet. * News item: Man smears feces on his lawyer, flings it at jury. Further down in the article it says…. …and for that the judge increases the guy’s bail from $250K to 1 million? C’mon judge, have a heart! Water and Nillumbik Council have dropped plans to blow up rabbits with explosive gas after warnings about fire dangers. The last 12 days or so have been VERY difficult. All this business with my car, project breakdowns at work, dealing with the attention spans of kids on the football field, trying to coordinate schedules with all of humanity and the multiple crises in the house have made me want to stay in my basement, order a crapload of hot wings and turn on the NFL Network. Reading Jerome’s words, well, it was like reading a mirror image of my last two months! Because on Friday nights, totally fried, zonked, ridden hard, and put away wet from work, I’d stagger out of my bedroom office, take a shower, and then head down to the local pizza joint where I’d sit at the bar and reconnect with humanity by shooting the breeze with a couple of the regulars there and engage in some harmless flirting with the cute waitresses decades younger than I. But, more to the point, I’d have my glass of wine and order me up a take-out order of a couple dozen hot wings (with a salmon special for Tracey) and then head home where I’d veg out in front of the TV and munch contentedly on my hot wings while watching The Golf Channel. Which got me thinking: is that what life has become in this modern workaday world? To work one’s self sleepless and senseless until your brain is capable only of reverting to some prehistoric instinct to gnaw on chicken wings until the pile of bones resembles some ancient offering to the gods and your mouth is aflame, all the while numbing one’s brain with mindless sports entertainment? If you’re, say, some tribesman in Outer Mongolia who’s had a tough week on the range keeping those herds together, do you crave the same thing? Or (so as not to be seen as sexist) do women have the same pent-up desires after a hard week at the office or keeping the kids in line? Do they too find themselves craving a platter of wings to devour over, say, some pretty-colored cocktail and watch a Keanu Reeves movie? Is it the work? 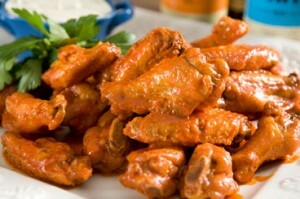 A primal need for hot wings? And, what is it about that combination of fowl and hot sauce that drives mortal human beings to this sorry state of affairs? Why not be thinking, ‘if I can just get through this week I can relax with some goose liver pate and veg out to my Wang Chung collection’? I only ask because I’m human. Or male. Or insane. Or all three. So this is what daylight looks like! My apologies for the extended time underground – never worked so hard in my life! The last two weeks have been quite difficult and stressful at work, and I have to admit the 16- and 18-hour days and a looming reduction in force was getting me a little paranoid and freaked out. Best not to blog in those kinds of situations – after all, this humble weblog should never become a forum for any litany of ‘oh woe is me’s when there are many people out there a heckuva lot worse off than The Great White Shank. So after a blowout week of doing nothing but working and 5-hour sleeps I’m like Punxatawney Phil, just a few days early. The only shadow I’m seeing is on my face and I’m looking forward to putting on some real clothes for going out in public. So what have I missed while I was gone? Ummm…. nothing. Oh, I see we have a new President. Forgot all about that. I wonder what all the Bush-haters on the loony liberal left will now do with all their pent-up hatred? They’ll probably have to channel somewhere else – like Rush Limbaugh, perhaps? That’s a battle they won’t be able to win. For one thing, Limbaugh doesn’t care – heck, he relishes in it – and secondly, he won’t change. The reason he’s been so successful and a survivor is the consistency (and, for conservatives, the timelessness) of his message. He’s not necessarily my cup of tea, but I can’t disagree with his general philosophy. I agree with Ed Morrissey – President Obama is making a mistake picking a fight with Limbaugh. If want to demonize a politician on the other side of the aisle, that’s one thing. But to pick a fight with a private citizen over his politics when he’s simply expressing his freedom to express an opinion demeans the office of the President (something I have a feeling the “office” better get used to) and diminshes the President himself. Mark my words, Barack Obama may be supercock in Chicago politics, but that game doesn’t translate as well outside the Beltway. If if he tries to play that brand of hardball with non-politicos simply because they’re not willing to drink his Kool-aid, he’ll get slaughtered – and not by conservatives. The country will expect and deserve better. Methinks the Prez ought to worry less about a popular radio talk-show host and get on with the business of turning this economy around. If, that is, that’s important to him. Me I’m not sure. But then again, I haven’t drank the Kool-Aid. In the mail: Elvis: Ultimate Gospel. Can’t wait to hear The King rocking sweetly to the Lord. Hah! That’s a good one, Jerome! You mean, something like, “A horse walks into a bar; bartender looks up and says, ‘Say buddy, why the long face?’ “. It’s not just been one of those days, it’s been one of those years! Glad it’s almost over – only 339 days left. I can’t wait to turn over a new leaf in 2010. What a night! After two straight 18-hour days I’m free for a hour or two before I call it a day. I feel like that scene in “A Hard Day’s Night” where the Beatles sneak out the back door and go crazy running and jumping around the football field. Wow! It’s a warm night out here on the patio. There’s a steel-gray sky above and a soft rain falling. The Pinot Grigio is cold, and (Rob won’t like this) but I have Herb Alpert & the Tijuana Brass softly playing in the background. This is the time of year why people live in Arizona. It sure ain’t for the summers! The pool is 54 with a bullet after a series of warm days in the ’70s and nights only in the ’50s. One of the neighbors is having a small get-together, and they’re chattering away on their patio. Nice. Sounds of life. Have you checked out the soundtrack to “O Brother, Where Art Thou?”. If you love Depression-era country music touched with bluegrass, Appalachian, blues, and gospel there are some fine tunes on it. A far cry from Herb Alpert, I know, but no one ever accused The Great White Shank of not having an eclectic taste in music. “The Big Easy” soundtrack is always a good listen as well. But I’m now looking for more old-style Southern gospel blues artists, nothng contemporary. Primitive. Authentic. Bluesy. Ideas, anyone? Favorite sounds: 1) Thunder in the distance; 2) Wind in the trees; 3) The pitter-patter of rain on the roof; 4) Waves breaking on a shore; 5) Rabbits crunching in unison. It’s a good thing the weather is nice, because the people out here are idiots. Maybe it’s just me, but I find it creepy all these people who believe that Barack Obama becoming President tomorrow is going to usher in some new era in human history, like some modern-day Age of Aquarius Messiah come to save the world. Don’t believe me? Click here, and here, and here, and here. Never mind the fact that the guy does nothing to downplay those expectations. Wait till they all find out he’s just another Chicago pol interested only in his “legacy” and consolidating his power. Boy, on that day a hard rain’s a gonna fall. Hey, the signs are already there. It’s not just the cost of his inauguration when supposedly (pardon me if you’ve heard this already) the country is in the middle of a severe economic downturn. Or the fact that the rich Beltway insider fat-cats are the ones getting all the choice perks. That should come as no surprise to anyone – you don’t become President of the USA without knowing how to play hardball politics and throw money around. But pardon me if I’m not impressed. Maybe it’s those insipid commercials on television for the Obama commemorative plate. Or the Obama baseball caps on sale at the local Walgreens. To me, it just goes to show what old washed-up and worn-out John MCain was up against – I mean, you wouldn’t see McCain baseball caps on sale at the local pharmacy, right? What would they say on the front? “Maverick”? Look, I don’t wish the new President ill – if he’s successful maybe I’ll be able to find a job faster when I get laid off. But pardon me if I won’t watch or celebrate his inauguration. For some it’s a historic moment, and I say let them enjoy the thrills and chills of his inauguration day. But don’t come crying to me when the guy fails to live up to the impossibly high expectations being set for him and he turns out to be nothing more than the Wizard behind the curtain. Believe me, he has no more clue than you or I would as to how to turn things around (other than, of course, to spend money he doesn’t have and redistribute wealth it wasn’t his to begin with, but you can’t blame him for that – after all, he is a liberal). But wait until his fellow libs and Democrats realize he’s just another power-hungry pol making it up as he goes along and doesn’t give them everything they want – like spoiled children they’ll show their true hateful, spiteful and petty natures. President Obama’s about to find out how liberals – you know, the party that stands for “compassion” – play the game. On a purely historic level Barack Obama’s inauguration is a day worthy of note – no one, given this country’s history, will argue that. But a day of hope, good will, and celebration? Excuse me if I forget to bring the popcorn and streamers. Given the world around which he enters his Presidency, methinks the fella is in for a rude awkening. After all, in the end, he becomes President of just one nation in a brutal world of sick, ruthless enemies and hateful people where life is increasingly cheap. Hope it all was worth it, Messiah. The past week has been warmer than usual, and as a result the pool temperature has climbed from its 48 degree nadir to a toasty 52. The first mourning doves have begun appearing and cooing for prospective mates, and the forecast for next week calls for a chance of thunderstorms so can spring really be that far away? It’s been a rough winter up in New England – one of the harshest in years – but take heart, fellow Goodboys and friends and family members, it may not seem so right now but spring really is creeping towards you (creeping, of course, being the operative word here). So tonight President George W. Bush bid farewell to the nation in a televised speech. My feelings about the Prez have changed 180 degrees since he was first elected. Sure, he was challenged almost right off the bat with the 9/11 attacks, but whatever goodwill and political capital he might have garnered in those awful days and weeks that followed quicky dissipated with his decision to remove Saddam Hussein from Iraq and the quagmire that followed there. Perhaps if he had just turned Afghanistan to a big parking lot and took down the Taliban in a massive all-out assault against Al Qaida and Osama bin Laden his legacy would have been different, but Iraq will forever be the stain on his presidency. You don’t commit the lives of American soldiers to do a job a nation isn’t willing to do on its own accord. I personally don’t buy the rosy outlook some are talking about for Iraq. Once American forces are outta there we’ll see just how badly the Iraqi people cherish their freedom, but violence is the way of life in the Middle East, and years from now I’m afraid that, just as in Vietnam and Korea, a good many young men and women will have died or been permanently injured for no good purpose. I’ll admit I was wrong on this, as for awhile I actually bought into – somewhat grudgingly, I suppose – the idea that the Prez was doing the right thing. But events in his last term have convinced me the guy will go down next to Buchanan, Harding, and Hoover as the worst Presidents this country has ever had to endure. Simply put, this President was so consumed with being Commander-in-Chief that he forgot he was President of the United States, and in that regard, there was absolutely no discipline when it came to managing the country’s governmental and economic affairs. The Hurricane Katrina fiasco showed the President to be a disengaged delegator of authority, almost to the brink of criminality. With the help of other Republicans, he oversaw some of the greatest spending increases in history, to the point where Republicans and conservatives grew so disheartened that the Republicans first lost their majorities in Congress and then their shirts in the 2008 elections. His economic advisors allowed the Democrats to overhaul the way Fannie Mae and Freddie Mac did business, and steamroll lending institutions into underwriting mortgages for people you wouldn’t even lend a $20 to on Monday with the expectation of getting it back on Friday. And his administration sat back while greedy, corrupt bastards and fatcats on Wall Street ran their institutions into the ground, then went crying to the government for bailouts that have now gone beyond anything people would have imagined even a year ago. And for those eight years the looming crises involving entitlement programs like Social Security and Medicare were just allowed to sit and fester for a future administration to deal with. 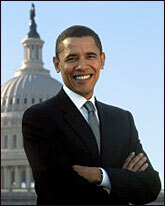 Can anyone think of one politically courageous act undertaken by this President? I sure can’t. President he might have been, a leader he was not. So excuse me if I say good riddance to President George W. Bush. Enjoy Texas, W., write a book or two, oversee your Presidential library, but you’ll get no favors from The Great White Shank. I voted for you twice, but who the hell else was I going to vote for? Al Gore? John Freakin’ Kerry? I mean, if that’s the kind of choices the American public got in the Presidential elections in 2000 and 2004, then I guess we deserve everything we get in the election in 2008 of President Barack Obama. Who knows, maybe I’ll be proven wrong. Maybe President Obama won’t run this country into the freakin’ ground by spending untold billions of money the government doesn’t have. I sure hope so. But nothing I’ve seen about this guy since his election gives me cause for thinking he has a clue about anything except to spend money he doesn’t have. Hell, even I could do that. But that’s for another day. Tonight President Bush said his farewell to the nation. I have to think that few cared enough to watch, and that the majority of Americans are either saying ‘good riddance’ or breathing a fearful sigh of relief. This is just another example of why being an Episcopalian doesn’t mean anything to me anymore. Or, as hard as it is to write these words, an Anglican anymore, either. On the other hand, I think this is a good idea. I mean, let’s get a handle on this kind of stuff. Let God do His thing in His own way. 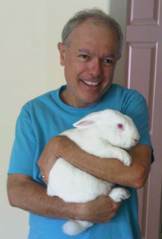 Take it from one who knows – people who underestimate rabbits will pay the price. Is the Obama administration one of the most corrupt before it even takes office? One can only imagine the storm that would erupt from the Loony Left if John McCain’s incoming choice for Secretary of State refused to disclose potential conflicts of interest. Why, the New York Times would be running full-page spreads! How I miss Louisiana, New Orleans, and the Mississippi River. Nothing else to add, just an editorial comment. Next time I’m buying lunch for my blogger friend Rob. Maybe in May, Rob! …And don’t forget to visit Dave’s blog. I feel bad not even having the time to send New Years wishes to my blogging buds. Happy New Year, Rob and Dave! You know what really irks me to no end? Seeing those Golf Channel commercials touting upstart Anthony Kim as a “hero”. A hero? Because he’s dynamic and has won a couple of golf tournaments. Methinks PGA Tour head Tim Finchem needs a slap upside his head. You want heroes? Look at those who are fighting for the freedom of others in places like Afghanistan and Iraq, or the neighborhood police and firefighters who put their lives on the line ever day for each one of us. This is no knock against Kim – he’s a hell of a golfer and fun to watch. But a hero? Hardly. There are no surf bands in Albania, and I’m losing a $5 bet to Bea at the Friday pizza joint because of it. Congrats to Red Sox slugger Jim Rice, elected to Major League Baseball’s Hall of Fame on his last year of eligibility yesterday. I always liked Rice as a player but never thought much as to whether or not he was HOF-worthy in terms of career numbers. But I’ve always liked him as a NESN analyst – he always wears great ties! – and Red Sox fans everywhere should be feeling mighty proud of Rice’s election. Can’t wait to see the ceremony when the Sox retire his number and hang #14 on Fenway Pahhk’s right-field bleachers this summer. Ought to be quite an event. 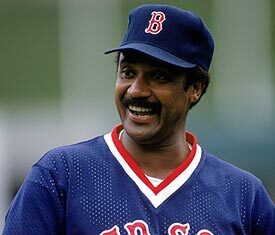 I think Jim Rice should get some ink on your web blog. It took 15 years to elect him into the Hall Of Fame. His stats speak for themselves. I’m not sure how you can top that. Spoken like a true Goodboy. Thanks, Cub!